And this Instant Pot Beef & Barley Soup is worth a place on any comfort food list. Tender chunks of beef, barley with its soft, yet slightly chewy texture, the rich broth. This isn’t a “back of the barley box” recipe. This is a real deal Beef & Barley Soup, absolutely from scratch, beef broth and all. I do have a Beef & Barley Soup on my blog already and it’s delish. That recipe’s a shortcut method for Beef & Barley Soup that I make with a doctored up broth and leftover pot roast, mostly because it’s so hard to find good soup bones where I live, and when they’re available they’re super pricey. This time I lucked out & started with three short ribs that had a good amount of meat on them and totaled about a pound and a half; they were about an inch thick and four inches or so across and – surprise! They only ran $2.39 a pound. Short Ribs in my area can run up to 16 to 17 dollars a pound at a high and around 10 bucks (of course it always will say $9.99) a pound is pretty common. And while the short ribs were just a bit scrappy to cook on their own as an entree, they were just perfect for Beef & Barley Soup. I knew my Instant Pot was going to be just the thing to coax a fantastic broth and tender meat out of those bones, without taking all day to do it. While Instant Pot Beef & Barley Soup, being a real deal, from the bone soup, is still going to take some time (mostly hands-off) what you’re going to get for your efforts is a flavorful soup with a silky broth, hearty veggies, tender meat and glorious, nutty and slightly chewy barley. If you haven’t had Beef and Barley Soup like this, you haven’t lived! And while I love any Beef & Barley Soup, this one compared to the back of the box soup is like comparing prime rib to round steak. Both are good, but only one is to die for! Instant Pot Beef & Barley Soup is going to take about an hour, start to finish, but is going to be so worth the effort. You’ll start off browning the meat, removing in, then you’ll brown up the veggies. They get removed and then there is a bit of a departure from the normal recipes. You’ll add in the vegetable scraps and brown them up and they’ll get cooked up along with the meat, some wine, a few flavorings and the broth for the soup is made. That broth is so flavorful but do be sure to scrape up every last bit of fond (the build up on the bottom of the pan) for the most flavor and so you don’t get the dreaded Instant Pot “burn” notice. When the broth is finished, it’s strained, the meat picked off the bone, the veggies added back in and then the barley added to simmer away until it’s just perfectly al dente. Then, of course, you’ll serve with biscuits or soda crackers. How much your Instant Pot Beef & Barley Soup is going to cost you depends, primarily at what price you can find beef bones for. If you don’t happen to luck out at the supermarket, and if you have an Asian (or another ethnic market) nearby, check there. Too often processed meat comes devoid of bones – those are sold off for pet food and or pet/bones or other to manufacturing industries. I’m in the habit of always saving a bit of wine back for cooking if I happen to have any leftover. It doesn’t take much to totally transform a dish, and in this case, the slight acidity also contributes to breaking down the bone just a bit for a fantastic broth. If you’re in the habit of drinking wine, sign up for email alerts and watch for the big wine sales in the spring. Set Instant Pot to Saute. Add 2 tablespoons of the oil. Pat beef dry and salt and pepper both sides generously. Add to Instant Pot (in batches if necessary) and saute until browned. Turn and saute the other side. Remove from Instant Pot and place on a large plate. Add diced carrot, onion, & celery to the Instant Pot & cook, stirring and scraping up any browned bits from the bottom, until softened and lightly browned. Add the garlic and cook an additional minute, stirring. Remove vegetables to a bowl, to be added back in after the broth has finished cooking. Add remaining 1 tablespoon oil to Instant Pot and toss in the vegetable parings and trimmings. Stir until slightly browned (or until the bottom becomes dark). Add in the wine/water and scrape the fond off the bottom of the pan (use a wooden or plastic spatula) and cook until the wine simmers and the alcohol burns off, about three or four more minutes. Add stock, thyme, bay leaf, and reserved beef along with any accumulated juices. Close and seal the Instant Pot, set to High Pressure for 30 minutes. When finished, release pressure with the quick release valve. Remove the beef and set aside until cool enough to handle. Remove or strain the vegetable trimmings and parings and discard. Set the Instant Pot to Saute. Add the reserved, diced and browned vegetables back into the pot, and when pot comes to a boil, add in the one cup of rinsed Instant Barley. Cook for 10 to 12 minutes until Barley is tender. Meanwhile, discard the beef bones and cut meat into bite-size chunks. Return to the Instant Pot. When barley is tender, taste and adjust seasonings, adding salt and pepper to taste. This entry was posted in Click here for Bargain Meals, Click here for Fabulous Food Posts and tagged Alcohol, Barley, Beef, beef & barley soup, Carrots, Chicken Stock, Chuck Roast, Frugal Hausfrau, short ribs, Wine. Bookmark the permalink. I used this for a basic recipe but changed it alot. Sauted my crisp veggies a bit (carrots,onion,zucchini, small tomato, garlic) with a little oil and followed with wine. Reserved those in a bowl, put my broth 2 qts. ,barley ,more winetotal about 2 cups, some tomato paste1/2 tube, and my prime rib beef leftover from chritmas dinner and cooked on grains to get my barley cooked. Then released the pressure. Added my presauted veggies and leftover green beans and a few roasted potatoes also from Christmas seasonings to our taste – red pepper flakes ground with rosemary, black pepper, sea salt, and paprika. Put the lid back on and soup setting for 8 minutes. Released the pressure. Delicious. Thanks for a starter recipe. Hi FrugalHausfrau! I also make this soup when I have prime rib bones. It makes such a fantastic soup. Thanks for a great recipe! Hi Kellie, I just bet they make great soup! I can’t wait to try this in my IP! We love beef barley soup at our house. I usually make with a bit of tomato sauce or paste, but I think the wine will be a great change. I also love that this recipe doesn’t call for a bunch of salty box beef broth. Thank you so much for sharing the great IP recipes. 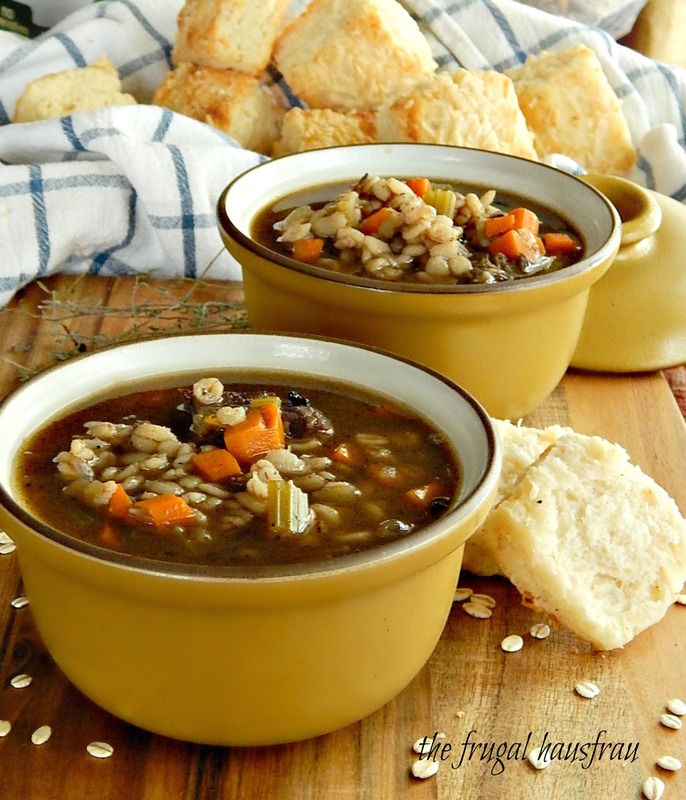 I love Beef & Barley soup and the wine was the perfect touch – although wine seemed a little “fancy” for it, lol! 🙂 & yes – it’s snowed three times!! Seems like it would just make the flavor a bit richer. I’ve always thought you wree so “fancy!” ha ha! hugs friend. hugs to you, too!! Did you see your biscuits in the picture?! They were good – I put black pepper and parmesan in them! Oh, and remembered the baking powder! I just posted on my blog that I’m a fair weather fan of soup, as I like biting into things, not drinking my meals (haha) – but this looks hearty, and delish! I’ve never made this soup, so will have to give it a go! My son is the same way. I could never figure out why he didn’t like soup and then he finally kind of mocked it by showing how to eat it very fussily, with his pinkie out and making delicate little slurpy noises, lol! This one is hearty and the barley is a little chewy, which is a nice compliment to the beef! Go forth and make it – you won’t be sorry! Your soup looks so hearty 🙂 Yum, this sounds like the perfect comfort soup and I love barley, so it is a winner !!! The perfect fall food! I used up all my soup barley on salads in the spring, so I need to restock! I think Barley is great in salads! But better in this soup, lol! My grandma used to make a similar soup, I loved it as a kid and even more now! Ha. I made this last Sunday, and ate it for breakfast every day at work. Pretty much exactly like this. Even though it was too hot for soup down here in South Louisiana, it just seemed right. This weekend it’s cold- chicken, sausage, and okra gumbo tonight! A tasty pot of this soup simmering in my dutch oven on the stove … great for a leisurely weekend’s cooking. Great idea. Yay, it’s soup season!! Fabulous soup and great find on the short ribs. Yeah, I was surprised – but they weren’t the big, meaty kind that’s perfect for braising, so soup it was! Haha! Yes Barley has sustained us (and our animals) for centuries! !